The silica sand filter, also known as water mechanical filter, is a kind of water filtration equipment. It is mainly used to remove granular impurities, suspended solids, colloids and other substances in water. 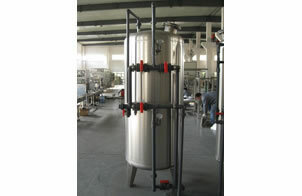 Its filtration medium can be silica sand, anthracite, and many other substances. The height of filtering material layer is more than 1200mm. The filtering material granularity and height should be in conformity with relevant technical requirements. Adding material and debugging the mixture can achieve the filtration effect, so that SDI of filtered water is greatly reduced. 1. The silica sand filter (water mechanical filter) is a kind of stainless steel multi-stage filter whose diameter is 600mm. There is well graded silica sand inside the filter. The filtering layer height is more than or equal to 1200mm. Under normal working condition, the total water output is 4m3/hr, and the effluent quality is less than 4. 2. The design current velocity is 10m/h. 3. The machinery is fitted with backwashing valve, thus manual backwashing can be achieved. Jiangsu Topling Machinery Co., Ltd is a professional manufacturer and supplier of silica sand filter (water mechanical filter) in China. Apart from silica sand filter (water mechanical filter), we have many other products: purified and mineral water filing line, juice filling production line, carbonated drink filling line and related equipments including active carbon filter, shrink packing machine (shrink-wrappers), etc. All of our products have got the standards of CE, and ISO9001-2008. With good quality and affordable price, Our company successfully offers many production lines for many well-known brands at home and abroad, such as Coca Cola, PEPSI. If you need silica sand filter, please contact us.